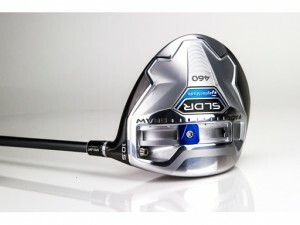 I was skeptical when TaylorMade-adidas Golf this past July introduced the SLDR driver. After all, the company had launched two drivers – the RBZ Stage 2 and R1 – earlier in the year. Another driver, I thought with my usual amount of cynicism, is just what the golf world needs. certainly easier than the R11 and R1 drivers. And in my case, the SLDR is better-performing – longer and more accurate – than the R11 and R1. And with its charcoal-gray color on the crown as opposed to the white crowns on the R11 and R1, it’s more pleasing to my eye. Is the SLDR 20 yards longer as TMaG boasts? Not the entire 20 yards, but I do see a consistent five-to-seven-yard increase. I’ll take that every time. It’s all a matter of swing speed and mine is only around 94 mph. It’s easier to manipulate the weighting system in the SLDR compared to its predecessors. That is, the new movable weight technology in the SLDR features a blue, 20-gram weight that slides on a track located on the front of the sole. It’s a simple process to move the weight up and down to dial in the desired amount of draw or fade. It doesn’t take much movement either direction to get results. I finally settled on the first notch on the “draw” side. Any farther down and the ball sometimes went crazy left. That’s good for players who like to hit serious draws that border on hooks. I like a slight draw and that what the SLDR delivered. I played two versions of the SLDR – a 9.5 with a stiff-flex Fujikura shaft and a regular-flex Fujikura shaft. The latter, with a 57-gram shaft, was far and away the better of two for me. The ball comes off the club face with good velocity and with a nice, sharp sound and a solid feel. The feel isn’t quite as soft as some of its competitors, but that’s not a problem for me. I like the feel (and sound) better than the R11 and R1 drivers. So when you’re looking for a new driver – there are plenty to choose from these days – slide a SLDR into your bag. I think you will like it.